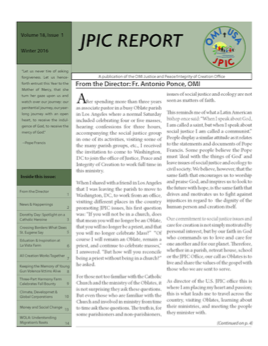 The Winter 2016 JPIC Report is Now Available On-Line! The Winter 2016 issue of the JPIC Report is now available online. It will soon be available in print form. Download the Winter 2016 JPIC Report here. Please contact Meghan Gieske at mgieske@omiusa.org in the JPIC Office if you want to be added to the mailing list. You can download past issues of the JPIC Report in the Resources section of the website.